Test: Made on average skill using the default setting on my computer [ AMD64 3400+ - 2Gb Ram - GEforce 6 128 Mb] some really small slowdown but without really impacting render of effect and graphics . Take to the skies in Medal of Honor Airborne, where you’ll drop into grueling ground attacks in a bid to turn the tide of WWII. Begin each mission in the air above Axis controlled battlefields, then make your mark in the largest airborne operations in history. Starting with your jump from a C-47 transport plane, every choice you make can seal your fate. In the air, control your parachute to select a landing spot that brings you the greatest strategic advantage. Follow the green smoke to recommended landing areas where Allied forces will be waiting, or go it alone by landing on rooftops or balconies. But craft your strategy carefully: every move you make, from your choice of landing spot to the enemies you engage on the ground, will determine your success in the mission, and whether or not you are truly one of the Airborne elite. 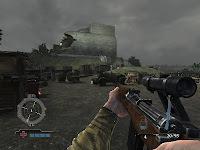 In Medal Of Honor: Airborne, you'll step into the boots of Boyd Travers, Private First Class of the 82nd Airborne Division. Engage in battles throughout Europe, from rocky beginnings in Sicily to war-winning triumphs in Germany. Each mission begins behind enemy lines, with an intense and fully interactive airdrop. Your ability to determine your own starting point dramatically changes the way each mission plays out. 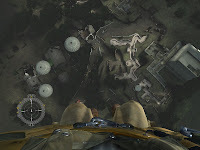 View the entire operation from the air, and then control your parachute to choose your landing spot. On the ground, gather your senses and assess the terrain. A wide variety of authentic, customizable weapons are at your disposal, each with distinct characteristics. 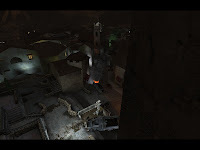 Choose your path in this free roaming FPS environment. 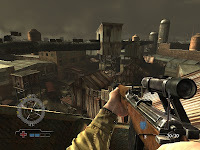 Medal of Honor Airborne will also feature exceptionally photo-realistic characters, adding to the intensity of the cinematic, story-driven game. Through 6 big missions , this new opus in the WW2 gaming experience will try to recreate the histrory from one of the more implicated squadron : Airborne. Electronic Aerts try to create with a casting comparable to the blockbuster movies (see end of the game credits), a perfect opus to the prequal in the MOH series with also an eyes trying to beat the one who push them ou from the first place: Call of Duty. Visually the game does't really disappoint us, and after a pass to the briefing room witch will put in advance the objectives you will directly be push into the action sitting in you plane before the drop. Till then everything seems right and enjoyable and the first vision of the dropping zone (picture here below on the left) is really impressive. 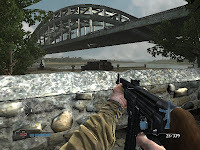 Weapons, environment, grenade effects most of the visual are really enjoyable and from great quality; atttention to detail (planes, realism of the environment ) are also well done but it's from the same quality of COD 4 and 5. Cutscenes are a little to sparse present and history parallelism doesn't really shine through mission to even add this unprobable tower bunker in the center of a town. 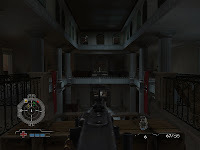 The location of all mission were not that interesting for me it's also perhaps because you always start by dropping from you plane to access an not open area for a first step that makes the feeling to have always the same playing routine. Mission have also a limited environment feeling day and night without no special weather experience (no hot sun no snow). You part of airborne so no use of tanks no sneaking mission nothing really changing through the 6 missions you will want to survive (at least you will survive a little bit more than your team mate). The explosion are really sparse and doesn't really destroit building so that your progression is always oriented in a quite static and repetittive way without surprise... except enemies. the mission were for me to repetitive and the first orientation you can give before starting the game by choosing autosave or customsave really let me dispaointed by the first choice. The autosave will each time you die remake a drop from your plane with as good objectif (but sometime unbeatable) to get those identied dropping zone to get the wings (5 per missions) but another quite furstating objectif is to pass trough zone where german are back... this also gave me a feeling of mutliplayer gameplay restarting after you die in a well identified zone were enemies just wait for you and I really hate this...The way to get were you want with you parachute is not really evident before everymission you have also to choose you weapons some are great but other not and one objectif is to fully upgrate all of then in my case I let some of them unused because they were not efficiant at all. 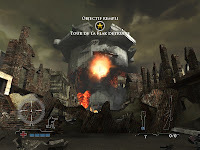 The special objectif (destroying things) where mostly statics and when you had some movable one it was more like a stupied turn over the place experience that something realistic. I had not a so good time playing this game the huge amount of time I died and needed to drop off for another time really let me a frustrating moment that let me a dispointed feeling...there was no really improvment in gaming experience through you progression except the fact that enemies became more and more challenging to fight against...the challenge is present everyware but execpt the dropping stategy there was no reall thinking and the fact that you can have some rewards to succeed in mission objectives certainly add values but will this compense the frustration I add to restart this experience, I doubt of it.